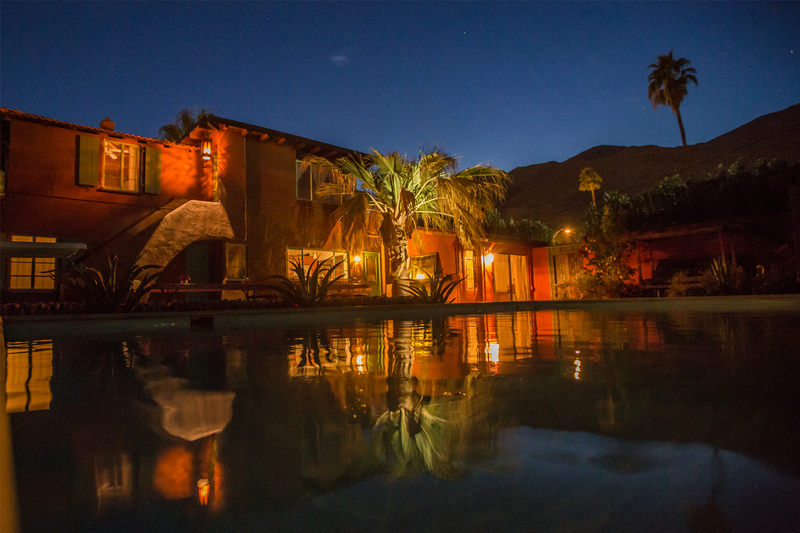 Available as a vacation rental (Palm Springs City ID: 2425) or a photography / film location, Casa Madrina is a beautiful 1930’s 2-story Spanish home located in Taquitz River estates, surrounded by colorful gardens and views of the San Jacinto Mountains from every area of property. It was conceived, designed and renovated by a husband / wife (photographer / landscape designer) team to revive the feeling of old Palm Springs and evoke a nurturing visit to ‘Godmothers house’. It has modern updates on the functional side, and is thoughtfully furnished with period antiques and vintage finds. The interior vibe steps you back in time in a way that is totally comfortable for the body and soul. The property is walled and gated for privacy with four separate bedroom suites including two in the main house, a two room suite upstairs and a stand alone casita. The airy kitchen is open plan and fully equipped and functional. The large living room has a cozy fireplace and French doors that open to a courtyard and mountain views. There’s a high-end projector for movie night and sound system including Crosley turntable and albums. No house phones. Ample street parking at all times. The original large swimming pool with diving board is central focal point of the backyard surrounded with outdoor dining areas, built-in outdoor seating / lounging for up to 16 with fire pit and fountains, hammocks, loungers and a1956 vintage trailer / bar. Pool heating is optional. Palm and citrus trees provide shade, against colorful walls and bougainvillea. Structural agaves and desert plantings add drama. Landscape lighting creates a warm ambiance for entertaining al fresco after the sun drops behind the mountains. Experience fine Palm Springs dining in any of dozens of great restaurants and bars. Several are walking distance and downtown is an quick 3-minute drive. A visit to Casa Madrina is your private retreat, to reflect, breathe and relax. There are numerous vacation rental properties in Palm Springs, particularly designed in the modernist mid-century style. Before the 1950s, all of Palm Springs was built in the Spanish Colonial style which gave the town its identity. Casa Madrina was built in 1936 and has been renovated to give the early Palm Springs experience throughout. As a vacation rental, it stands out as a mini-resort. It can be rented by the week. As a photography / film location, Casa Madrina is perfect for catalogue and fashion shootings. Not only is it your location, you can house 10 members of your team on the property during the production. Please contact us for complete details and rates. Casa Madrina is rented by the day (10 hours) or week and includes the residences and outdoor areas.